Today we welcome three of our newest members to the Bremen-Bethel family! Drake Burdett (left), David Burdett (middle) and Nate McCandlish all completed the requirements to become full members of our church through profession of faith. 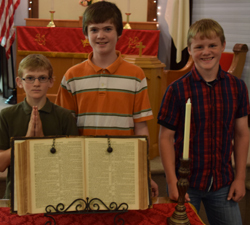 As full members of the church, these three young men can now participate in committees, and they have full voting privaleges in all church matters. Rev. Hoffmann describes all three as "fine young men, and it was a pleasure to have them in class these past few months." Welcome Nate, David & Drake - we can't wait to see the contributions you will make to our church! Welcome to Bremen Bethel Presbyterian Church! We're a small congregation of believers in Bremen, Ohio. If you are looking for a friendly family of believers who believe that God works in all groups, large and small, then you may want to come for a visit.